It's time for cookie monster fans to rejoice as Ben & Jerry's cookie dough pieces are finally hitting shelves this month. Great news for Cookie Dough lovers - Ben & Jerry’s little nuggets of glory are finally making their way onto shelves and into freezers as well as our hearts. So-called Chunk Spelunkers can now tuck in without all the mess. These snackable bags are available in stores and ready to melt hearts around the US. Even if you got warned by your mother not to eat raw cookie dough, well you're in luck because the latest offering is fine to eat thanks to its credentials of only containing pasteurized eggs and heat-treated flour. Besides the flavors of Chocolate Chip Cookie Dough and Peanut Butter, there's also a vegan version of the Chocolate Chip Cookie Dough. Previously, Ben & Jerry's Cookie Dough Chunks was a big hit in Vermont after they trialed it last summer. It was announced on JunkBanter's official Instagram account where they wrote, "There’s no denying that deep down, we’re all disgusting monsters. We love @benandjerrys because of how much crap they cram into our ice cream, and we also love eating raw cookie dough by the spoonful." There’s no denying that deep down, we’re all disgusting monsters. We love @benandjerrys because of how much crap they cram into our ice cream, and we also love eating raw cookie dough by the spoonful. Well, introducing bags of it. Ben & Jerry’s is testing these Cookie Dough Chunks - the same ones they put in their ice cream - at Vermont Scoop Shops. They’re safe to consume raw and if you Vermonsters gobble it up, it may be available online and in other distribution channels later this year. Big responsibility, Vermont. Please support “Oops! All Chunks” so the rest of the country can enjoy too. Thank you to @benandjerrys for including me in this launch; it saves me a lot of gas money on what would have been an inevitable trip to Vermont. It goes without saying the entire thing worked since the snack bags are back with a vengeance and retailing at a suggested price of $4.99. Although there's a possibility price might fluctuate depending on where you live, we can almost guarantee the Cookie Dough Chunks will be well worth it. Additionally, it’s great to see the fan-favorite ice cream company including vegans in its latest roll-out. Ben & Jerry's is well renowned for its vegan-friendly offerings, so this only further helps their cause. 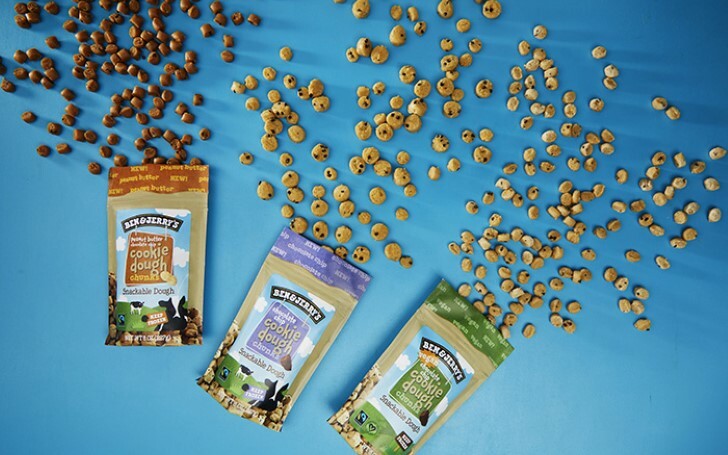 The Cookie Dough Chunks come in 1/2lb bags — with eight servings of the same good stuff you’ll find in the tub. All we need now is for the ice cream giant to release little snackable pieces of that strawberry cheesecake base.